I reckon we will have provoked extra-terrestrial intelligence into destroying us way before then. This is a tad too optimistic for my liking. If humanity is still using Fahrenheit at all by then, we deserve to be destroyed. Is there a version with °C ? Stotherd wrote: If humanity is still using Fahrenheit at all by then, we deserve to be destroyed. 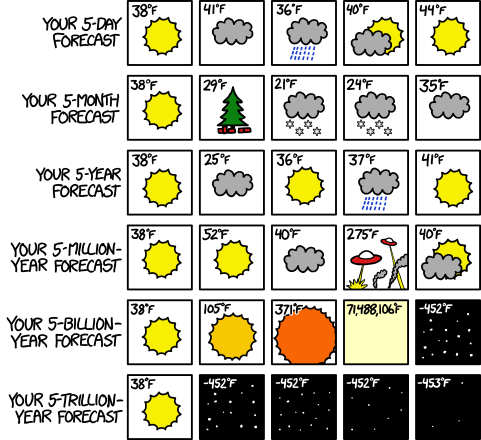 It would have been amusing if the last panel of the 5-year forecast was in Celsius. So why is the sun still there after 1 trillion years? I'm guessing the first column supposed to be 'now'? In that case it's a 4-day forecast isn't it? I can't really see us getting away from cylindrical/triangular aircraft/spacecraft. I don't know why, but perfectly circular craft don't seem human to me. Diadem wrote: So why is the sun still there after 1 trillion years? I'm guessing the first column supposed to be 'now'? In that case it's a 4-day forecast isn't it? I'm glad Randall didn't do a five decade or five century forecast, thus avoiding the thread turning into an AGW debate. Oh bugger, maybe I shouldn't have said that. A revolution of uplifted starfish laughing at our feeble bilateral symmetry, then? Just dropping by to say Hey! What's with the sig figs in square (5,4) ? And btw does anyone really believe the 5-day forecasts we get now? The fifth day is dang near to being wrong more than 50% of the time. Last edited by cellocgw on Fri Nov 20, 2015 3:52 pm UTC, edited 1 time in total. So we better take gloves AND a scarf during the heat death of the universe. True. Only three million years to wait, then. Anyway, perfectly disc-shaped craft might be designed at some point. If we ever reach the point where we've got enough lift ability to get pretty much anything to function as an aircraft/spaceship, why not design things to look like all the spaceships from retro-science-fiction? Well we leave before that happens, then we have a few more years to figure out how to summon Maxwell's demon to save us before the heat death of the universe. My thought was that in that line, the 2nd should have a C after the number, the 3rd and 4th should have random other letters, and the 5th should use a totally strange writing system. But your suggestion is just as funny, and probably more accurate in whatever the US is called then. I can't be the only person who instinctively picked up his mouse to click on the button to change to Celsius. I like how it takes 4 trillion years for the temp to drop a single degree. I hope we have an art deco future based on the stylings of the Chrysler Atlantique. Isn't "forever entropy increase" yesterday's science? I reckon that there is an ever shiny future for all friendly intelligent beings. Is anyone else wondering if each day this comic will show a different 5-day forecast? Anyone know what the forecast is for the negative zip codes? cellocgw wrote: Just dropping by to say Hey! What's with the sig figs in square (4,4) ? Fahrenheit is perfectly viable for measuring ambient weather temperatures. The 0 and 100 are actually useful in that situation, with 0 being very cold, while 100 is very hot. Both require extra precautions but are completely survivable. Compare Celsius where 0 is a bit chilly and 100 is near-instantly lethal. Not as much granularity in the measurements either, with less than a 50 degree spread of commonly useful numbers and entire seasons of less than 10 degree variation. On reflection, I'm disappointed the five million year forecast didn't include a flooded earth with a boy floating in a barrel while a ferret flies overhead. Or perhaps a future where the earth is over-run by small red spiders. orthogon wrote: I'm glad Randall didn't do a five decade or five century forecast, thus avoiding the thread turning into an AGW debate. No one has taken the bait responded yet, so I'll repeat the message. Alternatively: -10 Celsius is cold, 0 is chilly, 10 is cool, 20 is warm, 30 is hot, and 40 is survivable but requires precautions, and a difference of 1 degree is just about noticeable. Single digit temperatures are routine, and you never need more than two digits. For temperatures in Fahrenheit, you have to allow for a third digit, and desirable ambient temperatures are up in a range where numbers are getting fairly abstract, rather than being definite things. Does anyone notice the difference between 82 and 83? sotanaht wrote: Fahrenheit is perfectly viable for measuring ambient weather temperatures. Could be, if zero for Celsius didn't have that convenient (and very important) meaning that "the water is freezing". And, of course, Fahrenheit is worse for practically everything else. SCSimmons wrote: Fiddled around with possibilities for a bit. I thought milli-electron volts per molecule (of an ideal perfect gas) looked pretty handy for everyday purposes. The unit turns out to be just under 8ºC and almost exactly 14ºF, so it's not very fine-grained; reporting to tenths of a degree [sic] would give you comparable precision to what you see in weather forecasts, but the comfort categories can be that wide & still work well. I'll call this unit the Maxwell ºM [sic]; he got a nice law named after him, but as far as I know, never a unit, the poor guy. Huh. Normal human body temperature is ... 40.00 +/- .02 ºM [sic]. This must mean something, right? 35M is cold, 36M is chilly, high 37 through 38M is acceptable, 39M is a beach party, 40M is damn hot (and his/her body temperature). For Canadians and Russians: 34M is chilly, 35M is acceptable, 36M is warm, 37M and above is damn hot. For Mexicans and Australians: 37M and below is cold, 38M is chilly, 39M and 40M is acceptable and 41M is warm. The trouble is that that's laboratory water. Outdoors the water will probably not freeze because of sunlight and particles in the water. rmsgrey wrote: Does anyone notice the difference between 82 and 83? In air, no. In water, definitely. Kit. wrote: And, of course, Fahrenheit is worse for practically everything else. Agreed. Stuff like the height of a giraffe, the mass of a velociraptor, the electron flow through my house, and capacity of my hard drive are only very poorly approximated in degrees Fahrenheit. Kit. wrote: Could be, if zero for Celsius didn't have that convenient (and very important) meaning that "the water is freezing". Zero for Farenheit has the convenient (and very important, at least where I live) meaning that "salt won't make any difference". The trouble is that that's laboratory water. Not only. Where I live, It also means "beware of black ice on rural roads and buy two extra gallons of windshield washer if you drive on federal roads". pkcommando wrote: Is anyone else wondering if each day this comic will show a different 5-day forecast? Personally I went and checked the 5 day forecast for my area to see if the comic pulled data based on location. Apparently it does not. Once our solar system consumes itself, days and years will cease having any meaning. Crap, I made myself sad.